Our multi-day package gives you three full days of guided fishing on the White River. The package also includes lodging and meals at the White River Trout Lodge. It is located on the banks of the White River about 8 miles downstream from Bull Shoals Dam – 2 miles downstream of White Hole and 3 miles upstream from Wildcat Shoal. This location is right in the middle of some best Big Trout water on river and we have a private boat ramp. Many of our clients like to come for 3 days of fishing so we have setup a package deal of 4 night lodging and 3 full days of float trips with all meals included for $1500 per angler (based on 2 per room and boat). Trips can sure be customized to meet your travel and fishing needs and we do also offer full day float trips at $425 for 2 anglers. Adding extra nights of lodging and or days of fishing is not a problem. We do welcome group trips and are setup to handle up to 12 anglers per day. All of our boats handle up to 2 anglers. We do provide all the fly fishing equipment and I bring a nice selection of rods for those looking to check out new streamer rods and nymphing setups. We also provide all the flies that are needed. Myself and Eric Swies with be staying in Arkansas and guiding everyday. 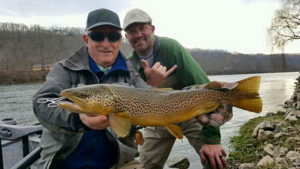 We also use some of the best local guides on the White River for our large group trips: Clint Wilkinson, Larry Babin, Matt Millner and Mike Winkler. For our winter trips a deposit of $200 per angler is needed to reserve date. A 50% deposit is needed by Dec 1st 2019. Remaining balance is due at the time of your trip.